This is the first update I’ve made on the Affiliate Marketing Challenge 4. Doing weekly updates of the past affiliate competitions seemed a bit too repetitive so I think I’ll probably stick with the launch, midway update, and final results posts from now on instead. There’s still plenty of time to register and earn your way to a prize (or prizes) so don’t let starting a little bit late affect your decision. In fact, it’s ridiculously easy to grab a spot in the New Referrals category; all you currently need to do is generate $25.01 to take the lead into 1st and be eligible to win yourself an 8GB iPod Nano. Here are the latest rankings as of October 15th, 4:25AM Pacific time. I’ve now referred a total of 107 affiliates to MarketLeverage, of which 9 signed up during this current competition. CD8083 made his first appearance since the second affiliate challenge in which he only made around $85. He is now commanding a strong position in 2nd place with over $4,000! If The Behemoth makes it to the $50K tier which he most likely will, then CD8083 will be moved to 1st place in the main category which would mean a lovely 24-inch Dell monitor for him. Believe it or not, there have only been 2 people who have blogged about this competition. That means that as it stands right now, if you wrote a blog post about this competition, you would be guaranteed a prize since there are 5 prizes available. My personal goal for this competition was for the total amount of commissions to hit $65,000. After two weeks, the total stands at $36,330.60 so we’re already on a great pace. Just signed up today (hope that I was properlytracked to you). Looking forward to it.. hopefully you’ll see CD11626 on the leaderboard soon.. I can confirm that you successfully signed up under me. I hope to see you on the leaderboard soon, too! 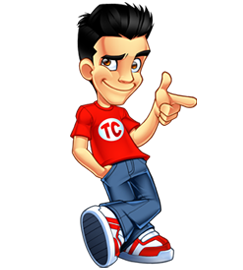 ps if you win a prize in the New Signup and Main Affiliate category, do you receive both prizes? Well Tyler, once again I’m gonna blog about this. Hope this time I win something!!! The contest seems to be going well so far, Tyler. I’m so excited about this contest. 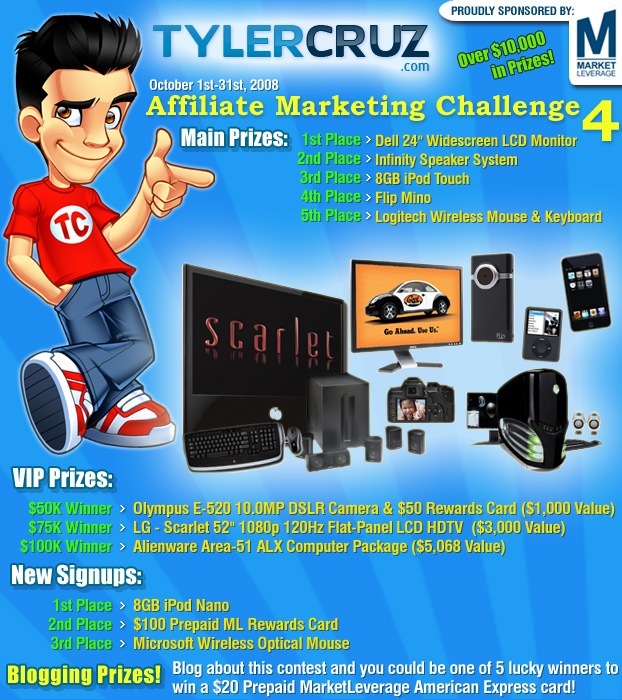 Thanks again for hosting another Affiliate Marketing Challenge with MarketLeverage. Good luck to everyone! Signed up but got rejected by ML….. WTF! Please contact me directly with questions you have regarding your application. I’m happy to look into the situation for you. Yeah, my problem with the competition is that ML doesn’t have high enough payouts or mail out the checks fast enough. If it could get close to what I’m getting on my regular network, I’d be all over this, but as it is, I’ll settle for the iPod Nano and maybe the speaker system. My application got rejected as well. The rejection email told to email for the reason, which I did; no reply.. Please email me your full name and I’ll look into it. I can be reached at dina@marketleverage.com, MLDina or MarketLeverage on Twitter, or MktlvgDina on AIM. @MikeHuang Unfortunately we can’t switch referrals. Reach out to your publisher manager to discuss some other incentives though. Good luck! How come the prizes on this post are a little different from the original contest page? The original had a Flip Mino as 4th place prize and 5th place as the keyboard. It’s now possible for you to track both your affiliate and other people’s affiliates. Can you have a contest like that next time? That way more of your readers could get in on the action.